Hi-Tech Pharmaceuticals Dianabol is a preparation with a strong anabolic effect, the name of which refers to the iconic agent used in the golden era of bodybuilding – methanabol. The supplement is based on a proprietary blend of ingredients, which consists of an extract obtained from rhizomes and above-ground parts of Dioscorea Makino, Rhaponticum carthamoides rhizomes extract, Ajuga turkestanica extract, 5-methyl-7-methoxy-isoflavone, 7-isopropoxy-isoflavone, as well as prohormones, including dehydroepiandrosterone, dehydroepiandrosterone acetate, androsterone, and 1,4-Androstadienedione. The preparation has been produced using the Cyclosome ™ technology, which is one of the most advanced ways to increase the bioavailability and supplies of various active substances contained in dietary supplements, such as, prohormones and many other ingredients that increase the body's anabolic capacity. The extract obtained from the rhizomes and above-ground parts of Dioscorea Makino contained in the preparation has been standardized for the content of sapogenins and glycosides, including 6-keto-diosgenin, spirostanol and furostanol, 5α-hydroxyaksaxin acetate, and 5R-Spirost-4-ene-3,6-diol. All of the above-mentioned substances are characterized by potential anabolic properties. Available sources report that they promote the growth of muscle mass, intensifying anabolic processes and causing no side effects resulting from excessive stimulation of androgen receptors. In addition, they favor the generation of a positive nitrogen balance, which increases the accumulation of protein in the body. Due to the high content of ecdysteroids, including the particularly active turkesterone and 20-hydroxyecdysone, extracts from rhizomes of Rhaponticum carthamoides and Ajuga Turkestanica perfectly complement the action of other ingredients of the preparation. In addition to potential properties affecting the anabolism of muscle proteins, both components are also characterized by an adaptogenic action that supports the body in periods of intense training. The preparation contains 5-methyl-7-methoxy-isoflavone and 7-isopropoxy-isoflavone, which belong to the group of phytoestrogens called isoflavones. These interesting substances are credited with the properties that increase protein synthesis, reduce cortisol levels and improve recovery after a physical exercise. Dehydroepiandrosterone (DHEA, 3β-hydroxy-5-androstadien-17-one) is a natural steroid hormone that is a precursor in the synthesis of testosterone. Due to the weak androgenic and estrogenic effects, it rarely causes hair loss, acne, gynecomastia, and water retention, and thus it can be successfully used during the periods of reduction or muscle growth. The product has been additionally enriched with the ester form of this hormone – dehydroepiandrosterone acetate, which is characterized by a longer half-life period in the body and stable release. Androsterone is a hormone belonging to androgens, which is a testosterone metabolism product with similar but weaker physiological effects. It can be transformed into dihydrotestosterone (DHT), which is more active than testosterone. DHT affects the efficiency of the central nervous system, resistance to stress, increases exercise capacity and physical strength, and since it cannot transform into estrogen, it is an ideal prohormone to increase muscle hardness. 1,4-Androstadienedione (3β-hydroxy-1-4-androstadien-17-one) is a precursor to the well-known and valued anabolic steroid – boldenone, which increases appetite, endurance, production of red blood cells and facilitates the building of muscle mass. The effect of boldenone is highly comparable to that of nandrolone, except that it carries a lower risk of side effects, and in case they occur – they are much milder. Administration of 1,4 AD enables stable and constant gain of good quality muscle mass, and thanks to its high versatility it can be used both to build muscle mass and to reduce body fat. 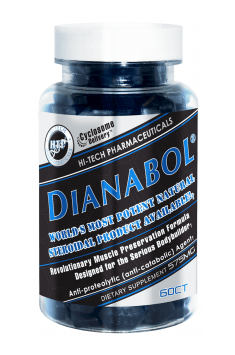 In summary, Hi-Tech Pharmaceuticals Dianabol is a highly effective preparation with an powerful anabolic effect, recommended to all those who are seeking quick and long-lasting body effects. The supplement facilitates the increase of muscle mass and strength even in people who have approached their maximum possibilities, thus allowing their further development. The preparation is perfect for both mass and reduction periods. Dioscorea Makino 50-67-1 Extract (Rhizome and aerial parts) (standardized to 6-keto-diosgenin, Spirostanol saponins, Furastanolic saponins, 5a-Hydroxy Laxogenin Acetate, 5R-Spirost-4-ene-3, 6-diol), Rhaponticum Carthamoides 100-1 Extract (Rhizomes), Ajuga Turkestanica Extract (whole plant), 5-methoxy-7-Isoflavone, 7-Isopropoxyisoflavone, 3B-Hydroxy-5-androstadien-17-one Acetate, 3B-Hydroxy-5-androstadien-17-one, Androsterone, 3B-Hydroxy-1-4-androstadien-17-one. Microcrystalline cellulose, dextrose, sodium starch glycolate, Explotab®, hydroxy-propyl-methyl cellulose, magnesium stearate, stearic acid, silica, FD & C blue # 1, FD & C red # 40.